In response to a closed-door meeting that the state Department of Conservation and Natural Resources held nearly a month ago on natural gas drilling in the Loyalsock State Forest, state Rep. Rick Mirabito, D-Williamsport, held his own meeting Wednesday on the campus of Lycoming College. Mirabito convened several members of the House Democratic Policy Committee to hear testimony from local and state environmental groups and citizens who were shut out of the April 4 meeting in Dushore. That meeting was held by DCNR with invited “stakeholders” only to discuss gas drilling and access to the so-called Clarence Moore lands that Anadarko Petroleum Corp. has expressed interest in tapping. Anadarko – along with Southwestern Energy Corp. – have rights to an equally divided area of subsurface mineral rights to tens of thousands of acres, while the state owns the surface rights. According to DCNR, problems exist because of the complex legal issues surrounding access to the land. At stake are nearly 25,000 acres of deep forest areas with unique wildlife habitats and watersheds that could be impacted by future gas drilling in the area. Mark Szybist, a staff attorney for PennFuture, a statewide public interest advocacy group, said at Wednesday’s hearing that DCNR has the ability to deny gas drilling outright due to deed provisions. “We shouldn’t be here today. The DCNR should be holding this meeting,” said Szybist, who said that the state agency refused to hear PennFuture’s concerns. He added that he found it noteworthy that DCNR has policy directives for most everything it oversees, except for natural gas drilling. Policy committee member, state Rep. Greg Vitali, D-Havertown, who also is chairman of the House Environmental Resources and Energy Committee, said that information he has seen indicates that 25 well pads have been proposed by Anadarko. Eleven of those would impact the Old Loggers Trail, he said. He said there would be an accompanying compressor station and increased truck traffic through Masten. The Sharp Top visa also would be broken by a well pad, he said. Vitali, who also works as an attorney, added that he has reviewed legal cases on access to the Clarence Moore lands. “In my view, it’s pretty clear there’s no right to access,” he said to the applause of about 100 people who attended the hearing. 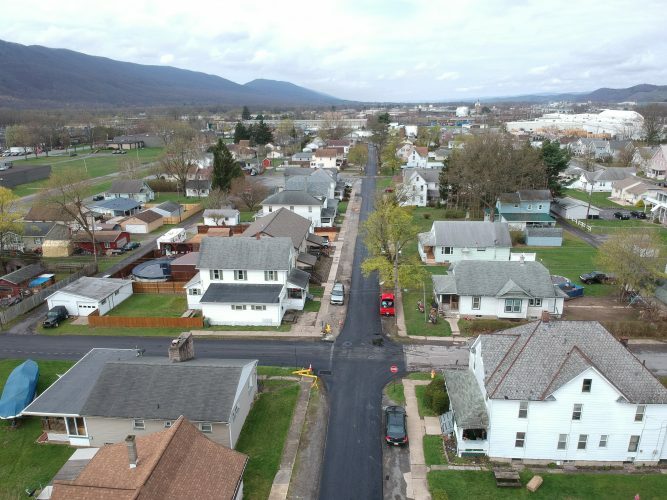 However, Mary Wolf, an Anadarko government relations adviser and former Williamsport mayor, said the company intends to minimize surface impacts if drilling is approved. She said that Anadarko uses environmentally safe practices when crafting its land-use agreements. “It will also apply in the Loyalsock State Forest,” she said. Wolf also said that Anadarko has provided revenues to the state and lease holders through its drilling activities. She said that the company has paid $238 million in fees to the state since 2008. Anadarko also has paid $9.8 million in income and franchise taxes and $1.5 million in state sales tax, Wolf said. Out of 110 local employees here, 75 of them are Pennsylvania natives, she added. Ralph Kisburg, a co-founder and now consultant to the Williamsport-based Responsible Drilling Alliance, said Anadarko purchased the Clarence Moore mineral rights cheaply “because they are compromised” due to deed provisions. “That’s their problem,” he said. “I hear threats in what she said. ‘We can take our money someplace else,’ ” Kisburg said of Wolf’s remarks. Kisburg said the proposed drilling area is home to rare plants and other species that thrive there. “These lands are special. They are extremely valuable” without drilling, he said. Mirabito said that citizens can make a difference in whether or not natural gas drilling takes place there. Several citizens provided testimony to the committee, which, in addition to Mirabito and Vitali, consisted of state Reps. Stephen McCarter, D-Glenside; Eddie Day Pashinski, D-Wilkes Barre; and Ronald G. Waters, D-Philadelphia. Officials from DCNR turned down an invitation to attend the hearing.